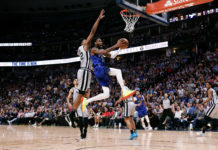 The month of March has been an interesting month of inconsistency for the Denver Nuggets as they’ve seen big wins against the Dallas Mavericks, Sacramento Kings and a convincing win against the Detroit Pistons. They have also won games against both the Cleveland Cavaliers and the Los Angeles Lakers, but, they also went into a must-win, playoff atmospheric environment on Tuesday night against that same Los Angeles team and folded. So, while there’s good to look forward to, there are definitely those ugly times. So, without further ado, I give you the good, the bad and the ugly. With much of the attention focusing on how the Paul Millsap and Nikola Jokic pairing has gone since Millsap returned after being absent for 44 games, one of the things that have gone overlooked is how Wilson Chandler has looked since then. On the season, Chandler is averaging a modest 10 points and 5.3 rebounds as he’s gone 44% from the field that had many questioning how committed to the season he was. But, in eight starts since Millsap has been back, Chandler has seen those numbers grow to 12.3 points and 5.3 rebounds while shooting 50 percent from the field. He’s returned to his starting role, is back to the small forward position, and he’s excelled being back in that role. Chandler has now scored in double-digits in four of his last six games including a game in Los Angeles in which he tied his season-high of 26 points. Against the Lakers, he also led the team in rebounding totals as well which happened to be his first double-double since February 23. In a win against Detroit, he went scoreless but did stay aggressive and assertive on both ends of the floor as he finished with five assists, eight rebounds, and a steal. Chandler has been a different player since the All-Star break. With only 13 games remaining, if Chandler can stay in a groove, Denver has a better chance at starting the winning streak they desperately need if they plan on being in the playoffs at seasons end. 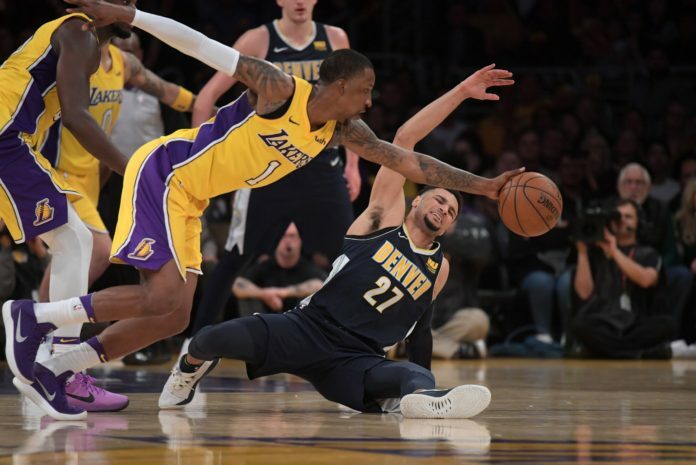 In the midst of a very close Western Conference playoff race, Denver took a devastating blow to their playoff chances as they lost 103-112 to the Lakers in an energy-filled and hostile environment on Tuesday in Los Angeles. 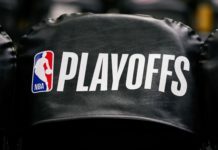 It was also a nationally televised NBA TV game on a night where the rest of the teams vying for a playoff spot all won, putting Denver in an even worse spot — in tenth place in the playoff picture. In the game, it was a massive run and a fourth-quarter collapse that ultimately cost Denver the game late. There was a 28-3 run by the Lakers that set the tone for the game and put Denver in a tough spot. 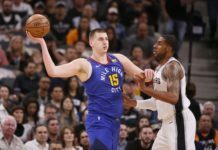 Jokic had early foul trouble, which had him on the bench for most of the first half. Will Barton and Gary Harris struggled immensely to get anything going as they combined for a 9-of-31 from the field. The Lakers got it going with their bigs as Julius Randle had 26 points and 13 rebounds (seven offensive rebounds) and Kyle Kuzma added 26 points. In an anticipated game where there was trash talk prior to the game, Denver was expected to come out and compete a bit harder — especially knowing what is on the line for their season. Luckily for Denver, Wednesday night was one of the first nights in quite some time that there weren’t any significant games that had Western Conference playoff implications, so Thursday night’s home game against the fading Detroit Pistons, who had lost five of their last six games, was a great bounce-back game in which Denver won convincingly as they attempted to bridge the gap before starting a big road trip that could determine if they make the playoffs or not. With their loss to the Lakers on Tuesday, Denver has made things extremely difficult for themselves in the playoff picture. They have a brutal schedule remaining and can’t afford to lose winnable games. Denver is now a full game out of the eighth seed with Minnesota, New Orleans, Utah and San Antonio all within a few games of each other. Denver has moved down to the tenth seed, Utah does not look like they will ever lose again and San Antonio should get Kawhi Leonard back sometime soon (maybe). For Denver, there is no hope of a savior coming along and turning things around. They have to go on the road and win, defend, and execute — especially late in games — if they want to turn things around. Losing games like Tuesday against the Lakers when an opportunity to keep pace in the Western Conference is the reason they’re on the outside looking in. On the bright side, six of the eight teams in the Western Conference quagmire played on Thursday and the Pelicans lost to the Spurs which helped things out, just a bit. Denver now heads on the road for the rest of March where each game counts.